The classic lemonade stand-style refreshment of this enduring favorite starts with real lemons and lively Guatemalan lemongrass. 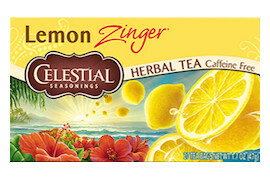 We blend our lemons with hibiscus, whose tangy taste and ruby-red color are the signature of a Zinger, to create a bright tea that's equally satisfying under the sun and the moon. Ingredients: Hibiscus, rosehips, roasted chicory, orange peel, West Indian lemongrass, lemon peel, whole dried lemons, natural lemon flavor with other natural flavors and citric acid. Contains soy lecithin.